Dog Training: How to control your dog when they're off leash - use a LONG leash. One of the most common questions I'm asked as a dog trainer is "how do I control my dog when they're off leash?" Well, if you're ASKING the question you should know that the answer is obvious - you can't! At least you won't be able to until you've done a lot more work with your dog. But you should also know that it's perfectly NORMAL to have a dog that wants to run to the state line as soon as they've been let off their leash. The "perfectly attentive" dog, a dog who automatically stares intently at their master wondering what to do next and always comes when called (without any incentive except their master's love), represents a very SMALL percentage of all the dogs in the world. Your dog CAN become reliable off-lead, through the proper training. Step number one, however, is buying and USING a very, very, very long training lead. For the most part, everyone is striving to get to the point where their dog listens, consistently, when they're not at the end of a 6-foot leash. In many training books (and classes), it's not always clear how you transition from all the on-lead work that you've done to the off-lead work. Also, there are many situations where you want your dog to be able to run freely (like when you're playing fetch in the yard, or when you're going for a walk in the woods), and the leash doesn't seem practical in these situations. Well, hopefully what I'm about to say will change all that. Whenever I train with a dog (and ALL of my interactions with a dog are training - even walks and playtime), I use an ultra-long, ultra-visible, ultra-wear-resistant training lead. These leads are 50 feet long, made of nylon webbing, and are bright hunter orange (which has an added benefit in the Maine woods during hunting season). They're also very manageable - they don't retain as much moisture as a cotton lead, and they don't cause rope-burn like a long piece of rope. Generally I can just let the leash trail behind the dog on the ground. In other words, I don't even hold it (especially during training and play-time). After you've gotten used to using such a long lead, you'll see that the length actually gives you quite a bit of time to react if your dog decides that they're going to take off. However, you can spend most of your time and energy focusing on the interaction that you're having with your dog and not worrying about leash management. I actually teach a dog to sit, laydown, stay, heel, and come without there being any leash contact between the two of us. What this means is that there is NO transition when the dog is off-lead, because they LEARNED all of the behaviors in an environment that simulated being off-lead (the long lead trailing behind them on the ground). The leash is there for the techniques that REQUIRE a leash and the occasional emergency (dog decides that a passing squirrel is more interesting than you). Using a long lead gives you a method of controlling your dog when they are at a distance away from you. For instance, you're playing fetch at the local park, and it's time to go. All you have to do is pick up your end of the lead, and coil it as you walk towards your dog (or you can use it to encourage your dog to come with you as you walk AWAY from your dog, coiling the lead as they approach). No more negotiations necessary (how many times have you heard the "c'mon spikesy. c'mon. No really, it's time to go now. C'mon spikesy"?). If your local animal control officers are lenient (or at least have a sense of humor), then you can honor the spirit of your local leash laws while still having the freedom to let your dog run/play fetch at city parks. You have to always hang on to one end of the leash, though. I actually do this here in Portland. Let's face it, having your dog on lead DOES help you be a more responsible dog owner, especially in urban environments. You set an example for people who have no control over their dogs, and whose dogs really SHOULD be on-lead (because they're aggressive, for instance). I can't tell you how many times I've been accosted where the situation would have been totally avoidable if the dog had been on lead. A long lead is way easier to manage (and grab, when necessary), than one of those retractable leads. Plus there are no cheap plastic parts to break when they get dragged along the trail. You can relax with your dog, knowing that they have the freedom to move, and knowing that YOU have control over them at all times. Using a long lead is a GREAT alternative to Invisible Fence when you're working with your dog in your own yard. You recall that we are actually trying to engage our dogs in their energized moments, right? Well, I've noticed that dogs tend to be quite inhibited when I've worked with them in invisible-fence-lined yards. At this point, if a dog has invisible fence I ALWAYS take them to a different location for training so they can be themselves instead of worrying about if they're going to get zapped when they run off to chase the ball. Use a flat collar, unless you're doing a specific training exercise that requires a different kind of collar. Work on your leash management skills. Practice holding onto one end of the lead when you walk with your dog through the woods or a park, letting the lead out when your dog wants to run, and then coiling it up, as you walk, when there's less distance between you and your dog. Pay attention to what's going on. Seriously, pay attention. You don't want to be pulled off your feet because you were engrossed in conversation with a friend while your dog was taking off in another direction. NEVER try to stop your dog short from a full run at the end of the leash. ALWAYS move a little bit in the same direction that your dog is going so that you can GRADUALLY slow them to a stop. Stopping your dog short could cause serious injury (or worse) to your dog, so go easy on them. Only use the leash when you are there to supervise. In other words, don't use it to tie your dog out to a tree somewhere. My on-line store is up-and-running, so these leads are available to NaturalDogBlog readers for purchase. They're 50 foot long, and made with 1" wide hunter-orange nylon with a chrome swivel clip - very durable. I can ship one directly to your door (using U.S. priority mail) for $33.95 (plus S&H). 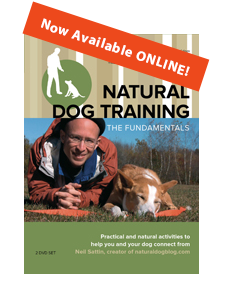 Visit the naturaldogblog store to purchase your ultra-long training lead. Thanks again for stopping by, and let me know if you have any questions/observations, either through the comments section or by contacting me. Now click here to learn about "pushing", the most fundamental technique in natural dog training. It teaches your dog how to pay attention to YOU in high energy moments - and, in fact, your dog will even become more attracted to you in those moments. It makes communicating so much easier. Neil, Thanks for a great article on an often neglected subject. Long lines are a fabulous tool, I hope they'll become a mainstream training accoutrement someday for typical dog owners. Looking forward to the pushing article! May I ask you about the complete opposite of long line work? 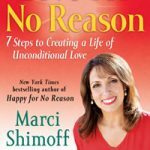 Do you have any thoughts on how to approach severe confinement fear? Car, crate, etc. (This pertains to a rescue dog that was just returned to the rescue group I help out with.) There's shaking and general hysteria, the works, regardless of whether a human is present or not. I have ideas, but I'd love to hear how you would approach this from the prey model. This is a male neutered rottie, btw, with an otherwise sweet disposition with humans and other animals. I will definitely address that topic in an upcoming post. 1. Teach the dog to relax. 2. Give them a reliable outlet for prey drive. 3. Use the outlet and their relaxation to enable them to relax at higher and higher levels of stress. 4. Teach the dog the down/stay in an energized, flow state. They will become anchored and more relaxed in the down the more energy that you add to the system. 5. Use VERY gradual positive reinforcement with the crate (or car). Feed them in the crate. Give them the tastiest of treats in the crate (all with the door open, i.e. without being confined). Steps 1-4 gives the dog a postive, grounded approach to dealing with their anxiety. Step 5 works with the specific problem item. Eventually you combine the two - which might look like having the dog practice the energized down/stay in the crate. Important - be ultra gradual. I realize that steps 1-4 are in the process of getting fleshed out in these blog articles. Hopefully the Natural Dog Training approach is getting more clear over time? So much to write about...so much to write about. Step 5 can be done without 1-4...but ultimately will be more effective when the positive reinforcement is combined with those other steps. Hi there, lots of great stuff here! Excellent! A couple more thoughts on the long line, at least with dogs like mine. I always use a harness, not a collar, so s/he is not going to get strangled or choked if somehow she got hung up, I never use a long line where another dog might gambol up and start playing, don't want two dogs tangled up in the long line! Plus, I stop the line with my feet. I stopped a long line with my hand once, and ripped all the skin out of it! My dog jumped after prey once, and I got rope burn on the back of my legs, so I also wear long pants now when using a long line. Thanks so much for your comments. I will say that the nylon leashes I use, while not "burn-proof" are definitely much easier on the hands than any cotton/leather training line that I've tried. So I use my feet in emergencies, but otherwise still prefer hand management, which also allows me to ensure that the dog doesn't get stopped short on the leash.